Apple FM has a number of streams in different formats and data rates. If the stream you try to listen to is giving you a problem, try another one. But we have streams that play in IE, Edge, Firefox and Chrome. Don't forget we also have Apps for Android, IOS, and blackberry. Our FREE mobile Apps for Android phones and tablets, iPhones/iPads, and Blackberry devices. Click on the Orange Button that matches your device to download and install the app. Enjoy Apple-FM anywhere, anytime. The best quality feed of Apple-FM for your prefered player. In case you have problems using AAC, here is an MP3 Feed. The up to date weather picture across Asia from Apple-FM. Remember you can keep up to date with that is happening on Apple-FM by following us on Facebook (facebook.com/applefm.net). You can also follow us on Twitter (@AppleFM) for news updates on Hong Kong, Apple-FM and other news. Apple-FM started in a small way in 2002 and has grown through building audience all over the world. Looking at the web server statistics we can see visitors from South America, Africa, Europe, North America, and all over Asia. In fact we have listeners in 118 countries. We are now available via the net in MP3, and AAC+. We can also be heard on iPhones, iPads, and through our Android App, on android tablets and phones. We are listed in major directories such as iTunes and Tunein. We are always on the lookout for new ways to reach our audience around the world, around the clock. As the internet has evolved from Modems to broadband, so has Apple-FM. Our software has been upgraded to enable us to bring you more entertainment 24 hours a day. Now we have ways to listen to match almost any way you may wish to listen to us. FM stations in some parts of the world now rotate as little as 200 tracks in a week and this can result in some tracks playing too frequently. We regularly play 4000 tracks with some seasonal variations. This means you should get plenty of variety in what you hear. Listen all day at work, with no repeats. And the library is being constantly added to, as we find new memories to play you. Although our target audience is by now in their 40's, some of these tracks will be new music to younger listeners. But the mix will stay strange to everyone, no matter your age. We have news about every 45 minutes. Some hours have no news and some 30 minutes apart, but mostly you should be up to date every 45 minutes. We also have Takin' Ya Back, AppCheck and other features. During the Australian Open Tennis and Wimbledon Championships we broadcast updates throughout the day including previews, press conferences and Championship history items, from reporters on site at the venues. As our audience is world wide, Apple-FM runs on a 3 and 8 hour programme pattern. Some programmes are repeated to make them available to all our audience. Some shorter elements are repeated at 3 hour intervals. Each week Kurt David presents 3 programmes of music from the The 60's, 70's and 80's. You have 3 chances to listen to each show. So no matter where in the world you are Takin' Ya Back is there for you. Hear hits and information about the stars that made rock music what it is today. All served up by Kurt in his friendly style. Hear the 60's shows on Monday at 0400GMT and Friday 1900GMT. The 70's show is broadcast Monday 1600GMT and at 0200GMT Wednesday. 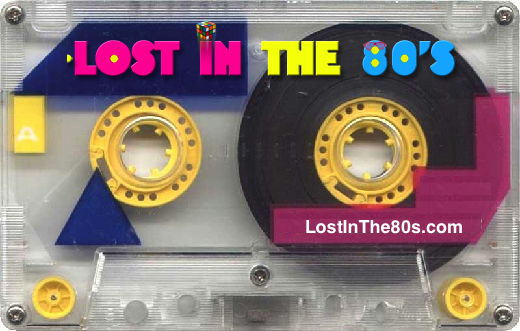 While the 80's show is on at 1000GMT Tuesday and again on Thursday at 1900GMT. You can hear all 3 shows, one after the other, begining at 0300GMT Saturday. Kurt also presents The Songwritters Search, which can be heard throughout the day. Hear the stories and find out just which star wrote which hit for which artist. Weekday nights from 2100GMT - 0000GMT. The Mike Overnight show is for those who work late or like Mike enjoying staying up all night listening to great music on your favorite radio station. The best music from the seventies, eighties and more, along with great games each hour that you can play along with. For the past few years Mike has taken overnight radio were no other dj would even want too, entertaining over night guest with music, fun and more. Make the Mike Overnight radio show part of your day, right here on Apple-FM each week night. Two hours with Derrick Jonzun playing '80s upbeat old skool and R&B hits. Lost in the '80s takes you back to the '80s like no other show. Features like The '80s Club Jam, One Hit Wonder, '80s Trivia and the Top Eight '80s compliment the music and provide a fun atmosphere for the audience. The music is consistently upbeat, from artists like Luther Vandross, Regina Belle, Babyface, Stevie Wonder, Atlantic Starr, The Pointer Sisters, Michael Jackson and many others; all who made R&B so great in the 1980s. Since Apple-FM began, we have always tried to be more than just music. The news output in important to us. That is why we have FSN (Feature Story News) providing our news bulletins and updates. FSN has reporters around the world and supplies news to some major broadcasters from New Zealand to Europe, via South Africa and The Vatican. You can hear the News (5 mins) 0000, 0600, 1200 & 1800 GMT Mon - Fri. (3 mins) 0130, 0300, 0430, 0730, 0900, 1030, 1330, 1500, 1630, 1930, 2100, 2230 GMT with 30 second headlines between these bulletins. Throughout the year we bring you sport coveage of Tennis & F1 Racing. Paul Walsh will report direct from the Australian Open tennis in January, and Wimbledon in June/July. He also reports on the Formula 1 qualifying and race days in the F1 calendar. We have been known to cover football in the shape of the Asian Cup, and Rugby world cups. Stay tuned for more sport from Apple-FM and @sportpaul. Throughout the day you will have noted that Ed sponsors a lot of our programming. From the only TV repair service in town that has been around since 1867, to the bank that has lengthened its lobby. The voice of these announcemnets is the late great Gary Owens, the voice of "Laugh in" in the 60's and "Soundtrack of the 60's", in the 80's. Owens coined the phrase "Beautiful downtown Burbank" which was later used on Laugh-In and The Tonight Show. Throughout the day we keep you up to date with the weather here in Hong Kong. Hong Kong is often over 30C in the summer, and the locals regard anything below 20C as very cold, or "oh dong!" Apart from Moon's updates, you can also see the weather in other cities in the region by clicking the Asia Weather link at the top of the page. In one two hour period recently we played ...... Lee Dorsey, Carole King, Rita Coolidge, Cheri, Manfred Mann's Earthband, Stevie Wonder, Katie Melua, Marlena Shaw, Love Affair, The Johnny Otis Show, Mary Hopkin, Herman's Hermits, Huey Lewis & The News, Blue Suede, Tracy Chapman, The Four Tops, Reunion, Jimmy Clanton, Lighthouse Family, Frank Sinatra, Ray Stevens, Elton John, Albert Hammond, Hotlegs, The Nashville Teens, Shakira, Minnie Ripperton, Mike Post, New Musik, Chicago, The Beatles. 24 hours a day we have a strange mix of music of these and other artists from all over the world. Japan, Korea, Ireland, Switzerland, South Africa, Australia, China and more. Some stations shout about "No Repeat Weekends". we have no repeat days everyday. More memories an hour - Apple-FM. Listen out for our new station jingles from Jingles Factory in Italy. The new material will grow into the Apple-FM sound over the next few weeks as we make more and more from the basic cuts. JF have supplied just the singing, long music beds, effects, and more to let us play and play for hours making more stuff. We are sure you will enjoy the new sounds. Listen out for the one that sounds like Long Train Running by the Doobie Brothers, or the one that sounds like a nice jazz tune, or there's the one with a hint of Gamble & Huff. Then there is more besides those. The autumn round of trade fairs in Hong Kong is drawing to an end. But one of the problems, while walking around the stands, is to sort out which are truly manufacturers and which are trading or reseller companies. Then there is the problem of quality control and checking the management systems of factories. For some, this can be a time consuming and expensive task. A company called OneReach tries to serve this need. They market themselves as your representative in China. They are not just for electronics, but also cover Tea, Clothing, Kitchenware, Cosmetics, and more. They can Source your products and then monitor productions, shipping and on-site inspections. If you want to inspect yourself in person, they will also help with interpreters, accompanied visits, transport pick-ups, and accommodation bookings. Their office is close to the Fu Tian/Lok Ma Chau crossing from Hong Kong into Shenzhen, so a quick visit from Hong Kong is quite easy. Then they can whisk you off to review possible makers for your products. The spring editions of the Hong Kong electronics fairs have been held this week in Wan Chai (HKTDC) and at Asia World Expo (Global Sourcing). With our usual love of gadgets we just had to go along. Asicer (www.asicer.com.cn) were showing their range of microphones (Well we are radio people). You may see outdoor press conferences on TV News with reporters holding the ends of their mobile phones up to the speaker to record what is said. But Asicer provide a better option for recording on your phone. 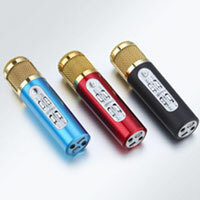 The little MC-098 can be plugged into the earphone socket of your phone and you can plug earphones into the bottom of the mic to hear what is being picked up by the mic. This will give a far better recording for news reporting. The mic has an internal rechargeable battery to power the mic on the road, or you can plug in a standard USB cable to power or charge the unit. The bigger MC-094 can be put in a desk stand or given a pop screen for recording in a studio setting. The mics can also be plugged into a PC sound card Mic input. 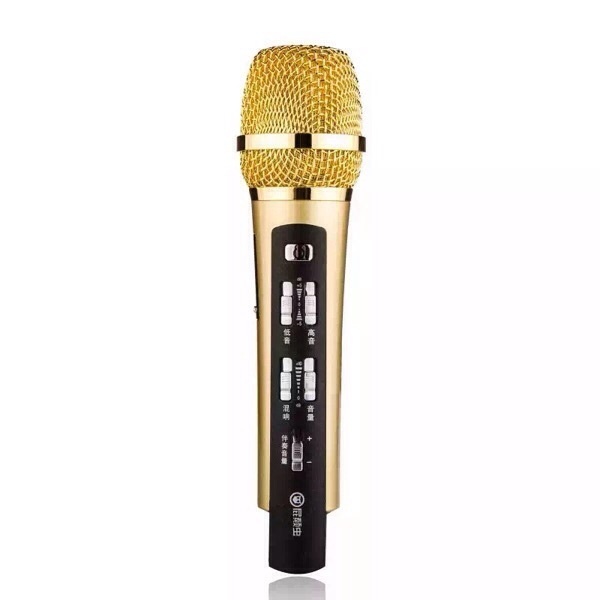 Asicer's mics can be used for Karaoke or voice recording. They have built in echo that can be faded out for a clean sound. The ability to monitor what you are recording all in one unit is handy for one man operation. So they can be suitable for home podcast recordings as well as news recordings. 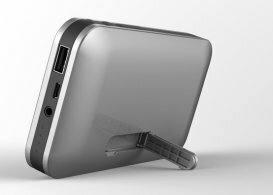 Just arrived from across the border is the MX7-B speaker & power bank from NCT (http://nctechno.com/). The sound quality is excellent, delivering 3W of audio output. It can play audio from an SD card, from a slot on the bottom of the device, or audio cable from your phone, PC & tablet, or you can link to it via a Bluetooth connection. 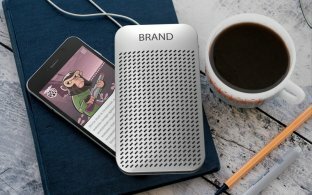 As there is a built-in power bank, you can use the speaker without wires for several hours. The power bank can also give 5000mAh at 1A to charge your phone if you need. The unit is well thought out with small nylon rests on the bottom of the MX7-B to protect it and your table top if you stand it up, using the little built-in prop on the back of the speaker. The prop also has a nylon tip to avoid scratches. There are also LED's to show how the power bank is doing, that it is charging and how much charge it has stored. We will be giving ours a good workout over Christmas, but our first day using it has been very pleasing. The New Apps Are Available! Our brand new mobile apps are now available for download. In the past we have only been able to supply apps for Android devices But now, with the help of Nobex, we can offer apps for Apple IOS devices like iPhones, iPads and iTouch, Blackberry devices, as well as a new Android App. The new programmes will select the best stream for your data plan, selecting a lower bit rate for 3G/4G users, and a higher one for wi-fi users. Please take a look at the new apps by clicking on the appropriate link at the top of the page. We would also like your feedback on how the apps work for you. As you can see, we have a new website. The old one was "Flash" and so is posing problems with more and more devices. The new site is written in HTML5 and so be visible on almost all mobile phones, tablets, and PC's. The new player is also HTML5 and so your mobile should play the station when you are on the site. We are still using the 64K feed for the website, as a lot of browsers have a problem playing AAC+. Hopefully this will change soon and we can use an AAC+ feed to save on your mobile data. But you can still go to the other feeds directly from the links at the top of the page. As ever we welcome your comments on our service, so please email us or use the contact form at the bottom of the page. Please remember the time difference when contacting us. We are GMT+8 and will reply as soon as we can. You should be listening to our 128K AAC feed right now. Details of our other feeds are at the top of the page. You may adjust the volume using the slider. If the Center of the picture is two grey lines, click on them and they will turn red. Some devices may take a few seconds to play music. Apple device users will need to click on the arrow in the middle of the player.